Come in today and sign up for our Loyalty Rewards Program. Receive points for every dollar you spend* and for every 300 points receive a $10.00 store use credit the following month. Points never expire and everything is kept in our computer, so there are no annoying coupons to print off and bring in. Loyalty members are also eligible for special weekly promotions on our Plant of the Week. Each week a new plant is featured and on sale at a special price, exclusively for our Loyalty Members. We also offer extra discounts and savings to our members throughout the year. 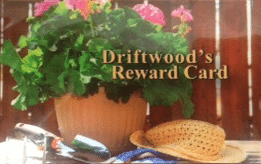 This program is an excellent way to explore Driftwood Garden Center and indulge your green thumb. *Points are not awarded for deliveries, gift cards, labor or sales tax.